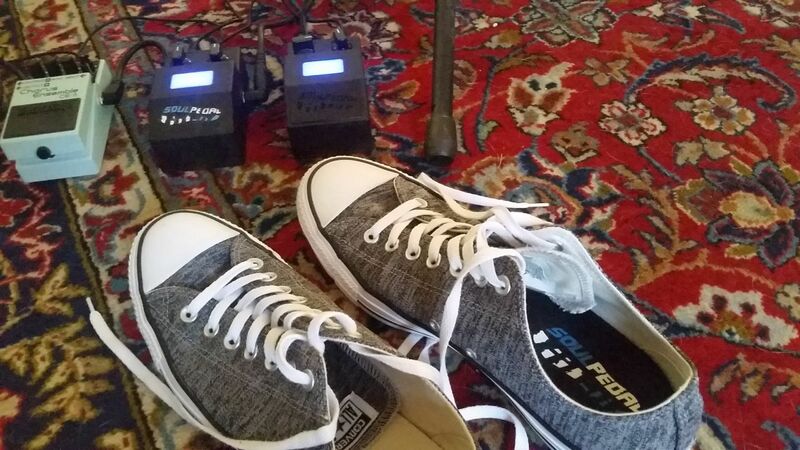 SoulPedal® Beta Testing Begins - A Wearable Expression Controller with MIDI in your Shoe? SoulPedal® (SP) is a wearable controller that slips inside your shoe (as an insole) and wirelessly controls effects for musicians. In this YouTube demo, local Beta Tester and Musician, Kody Raine of Chandler Arizona, explains how he's using MIDI Change Control messages from SP's wireless controller to modulate his own gear. Not so obvious in the video is that he's a Guitarist (with a great voice). And I thought MIDI was for keyboards... what do I know. SP isn't likely going to market until 2019, but we've got a couple functional Beta units on hand if you're the right people in the neighborhood, as these are still mostly hand built at home. It's all about usability and engaging with other creative types who like to move around on stage or add a new degree of control to their show. (Musicians don't like control, do they?) But don't think of this as just another MIDI controller or another thing just made wireless because we could. I honestly believe every band member could up their game on stage here, and that's not just another cliché marketing comment as you might be thinking. I can't wait to see what vocal artists will do with this (and the crowd won't even know they're in control). Really, any automation is fair game. The combination of Control, Expression, and Mobility are what what makes this unique. This whole project started one day in 2011 because my old 120 VAC Morley Wah fried a light bulb and I couldn't find a replacement in time for band practice. So I wired in an FSR (Force Sensing Resistor) to replace the light sensor, taped it inside my shoe, and it worked! So then Jimmy, our rhythm guitarist said... "That's cool, you should make it wireless!" (Sometimes I wish he hadn't encouraged that thought.) As inventor, my original goal was to move away from a rocker type pedal to allow for improved expression on stage... anywhere on stage. It just made sense to lean into a string bend or volume swell, and it turned out to be a very easy and natural movement for a better show. Oh, and with MIDI of course. True story, when we designed the Alpha unit in 2014, there were three keyboardist friends that insisted on MIDI. I had no idea why, so I contacted the founders at Source Audio but they couldn't really tell me what features I should include either. It was almost like everyone had it, just in case. I thought, why would any keyboard player need a wireless pedal when standing right there at their keyboard? Perhaps a Keytarist? And what guitarist used MIDI? But we had already hacked out the code so it became an experiment. Creator Brockett Parsons of the Piano Arc (with Lady Gaga)... ya, he liked it. REO's keyboardist Neal Doughty - nope, but he was curious. My keyboard friend thought it would might nice because his pedals could annoyingly slide away, but then someone came out with a clamp for that. MIDI just had that standard format to hook up to whatever. I was up for "whatever" and this demo was just my first result. I also didn't expect the comment "I love that I don't have to look down to find my pedals when I'm getting into a groove." I didn't expect that either, so the experiment continues. In the beginning, the prototype was a total hack using a Texas Instrument Chronos Watch encapsulated by an insole made from a glue gun, a torch, and a putty knife. (Arduino wasn't mainstream and I just wanted a CPU and Radio in a single chip to make it small. So it's still in the Sub-1 GHz radio frequency, and may eventually have Bluetooth for configuration management. Turns out lower frequencies have better range so we'll see.) For now, it's got some cool knobs that shape the control response "feel" (offset and curve), along with some unique analog features on the Wah (thanks to posts from Anderton). I'm now redoing the Wah PCB by adding Buffered Drive, Volume Swells, and Exp Out as a 10K pot (and all analog is opto-isolated). It uses foot gesture recognition to turn on/off but I can't wait to open that capability up for some real integration like tap control for Tempo. Foot tracking is something I've experimented with several times so multi-pedal control is definitely possible, but it's too soon for that just yet. Funny thing, I first engaged with this MIDI organization at NAMM in 2015 where I sat down with President Tom White who liked the idea and had this advice: "In the music industry, it's got to work really well and you probably won't make any money." The Indiegogo crowd-funding launch later that year was our first clue that he was right, but then Shark Tank called me up for an Audition. Having a lack of sales made it a tough road for that stage without at least an emotional story and we had neither. Since that "learning experience", our team went from seven members to just three with only myself actually working on it. I did take two years off to create other stuff at Tech Shop, but I kept coming back to SP with a few more tools in my chest. You can check out some SoulPedal® history and updates on Facebook and visit SoulPedal.com to hook up. It's just way too cool to quit now. If all goes well, the plan is that Kody will be using SP on stage next weekend (Sept 2018), MIDI controlling a Boss DD-500 for delay at will. We can figure this out together. SoulPedal® is "The Pedal that Moves with You! "™, CleanStage LLC, Patented, Copyright 2014, all rights reserved. Saturday, 25 August 2018 SoulPedal® Beta Testing Begins - A Wearable Expression Controller with MIDI in your Shoe?